Puerto Rico Municipal Bonds - How Bad Are They? Puerto Rico Municipal Bonds – How Bad are They? If Puerto Rico was an official state of the United States, Puerto Rico would rank 51st (dead last) when comparing the size of their debt to their Gross Domestic Product. It would be the only state rated below A by the three major credit rating agencies. With yields hovering around 4% for 10 year maturity dates, the yield is high compared to other states, which offer around 2%. Income from Puerto Rican Bonds is triple tax free regardless of what state you reside. While a New Yorker might have to pay state and city income taxes on a municipal bond issued in Texas, they do not on Puerto Rican debt. This feature greatly increases the tax-equivalent yield of Puerto Rican bonds. The constitution of Puerto Rico requires that debt holders be paid before any other expenditures. In theory, bondholders get precedence over paying government workers and pensioners. I don’t think this has every been tested in practice. There is a notion that the Federal government would step in to make payments, if the the government of Puerto Rico could not. However, when major municipal governments faced loan defaults in the past like the City of New York, no federal aid was forthcoming. There have been a number of great articles written recently which dive deeper into the numbers which I have included links to at the bottom of this article. I would also like to highlight 3 facts that I think deserve particular attention from investors. Puerto Rico is running a budget deficit (the difference between revenues and expenditures) of around $1.5 billion dollars per year. The government disputes this number. They argue the number is closer to $600 Million, once you take out one time items like refinancing maturing debt. Puerto Rico has amassed about $50 billion in debt and forward obligations (pension liabilities) which is over 100% of the state’s Gross National Product (GNP). This is over 5 times the amount of most states. If every dollar of state government revenue went to repaying debt, and the state did have any expenses, it would take over 8 years to repay the debt, and that doesn’t even include interest costs. The economy of Puerto Rico is stagnant. They are not on path to eliminate the budget deficit which will continue to add to their debt burdon. Puerto Rico is completely dependent on the continued willingness of investors to lend it more and more money every year. At some point, the appetite of investors will turn away from their bonds, which become increasingly more risky every year as their debt load increases. Until then, investors will enjoy after tax yields that are over twice as much as other Municipal bonds. 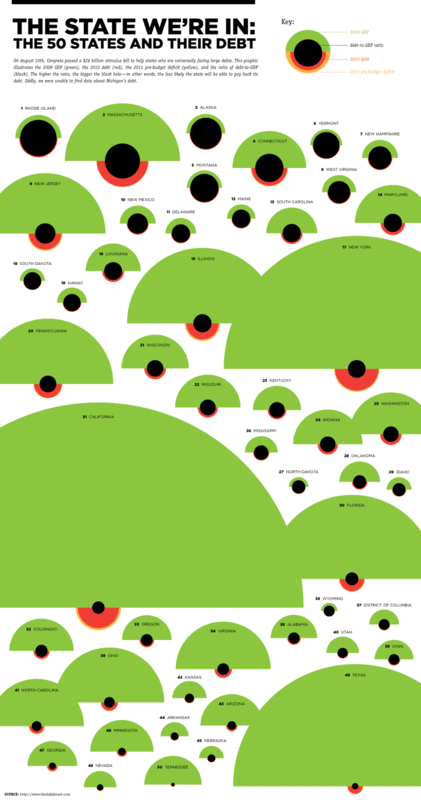 While slightly dated, the following infographic for Credit Loan gives a great sense of the relative debt burdens of states (not including PR) based on debt to GDP. Puerto Rico’s Debt to GDP is the neighborhood of 67%. Puerto Rico has (4) four IRS tax controllers in all 78 cities of Puerto Rico; these are: Hacienda, CRIM, Patente, and Contralor del Estado (State Controllers); therefore, to say that Puerto Rico has no IRS System auditing is a fallacious statement. All these IRS Office in P.R., charges and penalizes all businesses for not filling taxes on time; some are penalized and obligated to pay surcharges for late payments. Mr. Robert Donahue indicated that there are no IRS offices operating in Puerto Rico and this is a fatuous statement with no validity or truism. The U.S. federal government is tax exempt in Puerto Rico, and no where on this film, does it says that. The federal court buildings, federal hospitals, military stores, military passenger and cargo carriers, and U.S. Postal Office buildings are all tax exempt, and don’t pay property taxes to the Puerto Rican government or people. This means they make trillions of dollars off Puerto Rico. Has anyone thought how much money alone they make in goods and sales in the Postal Offices in all 78 cities of P.R. What about the Military cargo passenger and cargo airlines operating in P.R. , they are making trillions selling military goods and sales, while not paying any taxes in Puerto Rico. No where on this films do they says this. Inclusive, since 1898, Puerto Rico is not allowed to trade with any other foriegn country, as it is controlled by the U.S. Congress; therefore, Puerto Ricans are not allowed to expatiate and to improve their economical status. Puerto Ricans are surreptitiously forced in a wry manner to trade and purchase American goods, as 90% of Puerto Rico’s trade is with the United States alone. What Mr. Robert Donahue forgot to mentioned in this film, is that Puerto Rico has a ” Colonialism Economy” which causes an insoluble difficulty, as Puerto Rico is not able to open its own trade markets to bring more businesses, without going thru the U.S. Congress vicarious measures and U.S. imperialism. Don’t be such philistines; Puerto Rico’s GDP is greater than 12 U.S. states, and with all the proposed budget cuts and 36,000 government buy-outs positions eliminated, has made significant improvements in its economy since 09/2011 thru present. (You say that they (meaning P.R.) 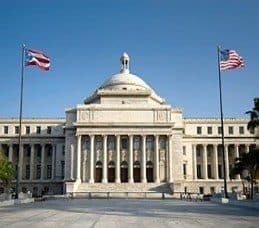 is not on path to eliminating the Budget Deficit, when the truth is that U.S. Congress does not allow Puerto Rico to have open trade markets to improve its own economical problems, so the United States is part of the cause as to why we have a Colonialism Impoverish Economy since 1898. P.R. is a big cry baby. It is unable to fix its economic mess. So it blames the USA. It wants to be separate but equal, with all the benefits but none of the obligations. of the problems really fast, it will happen won’t it??? Puerto Rico down? He did to Michigan but helped banks & some other entities. improve their ratings & problems.